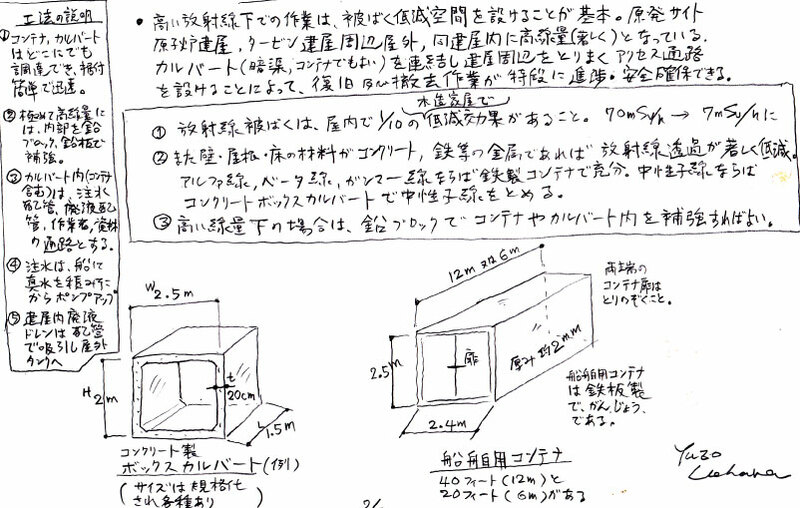 A former nuclear power plant designer with 36-year-experience Yuzo Uehara sent his proposal with the diagrams to this blog. Thank you, Mr. Uehara. The original diagrams are here and here. Mr Uehara has outlined a path forward that is very badly needed. It is clear that TEPCO has no idea of what to do. Hoping that reconnecting the equipment will somehow make it all right is stupid. The equipment has been flooded with salt water and wracked by big explosions. It is unlikely that pipes and fittings have survived undamaged. So there is need to plan for a complete dismantling of the site, which will be very difficult at best, but which is impossible in the current chaos. In the interim, the site is still spewing huge amounts of radioactive substances into the air, equivalent to about 10% of the Chernobyl total every day. This will continue for a long time, possibly years, until the fuel is somehow removed and put into safe storage. Japan has been lucky that the winds have thus far been mostly offshore, but this will change as the summer comes. The site will generate a 50km human exclusion zone much like at Chernobyl. Perhaps that will force serious action, which is entirely lacking thus far. Thanks for your comment. It sounds like you know the stuff. 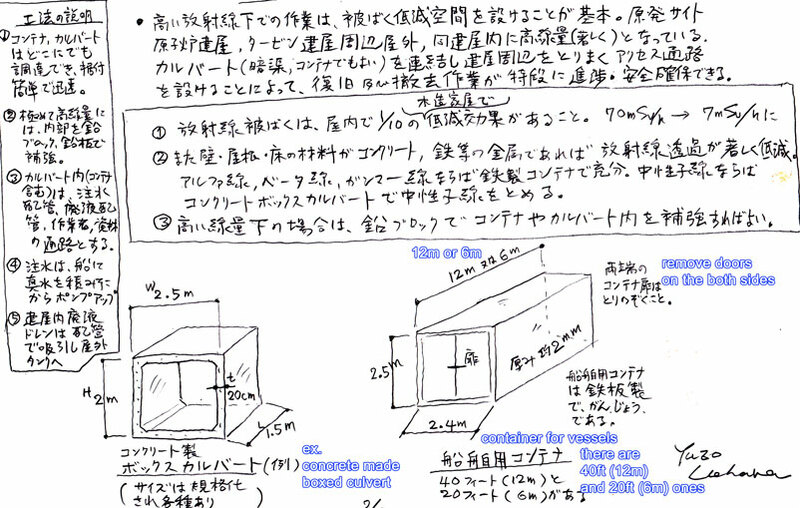 The texts have not been translated yet, but is there any part that is unclear in the diagrams? The diagrams are very clear. 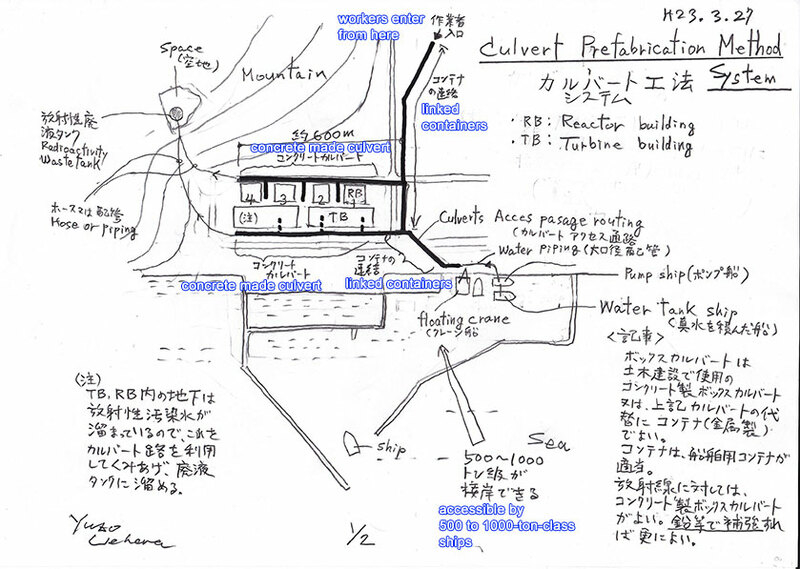 Mr Uehara has proposed a fast and useful approach to rationalize safe access to the site. The challenge is that safe access is just the beginning. 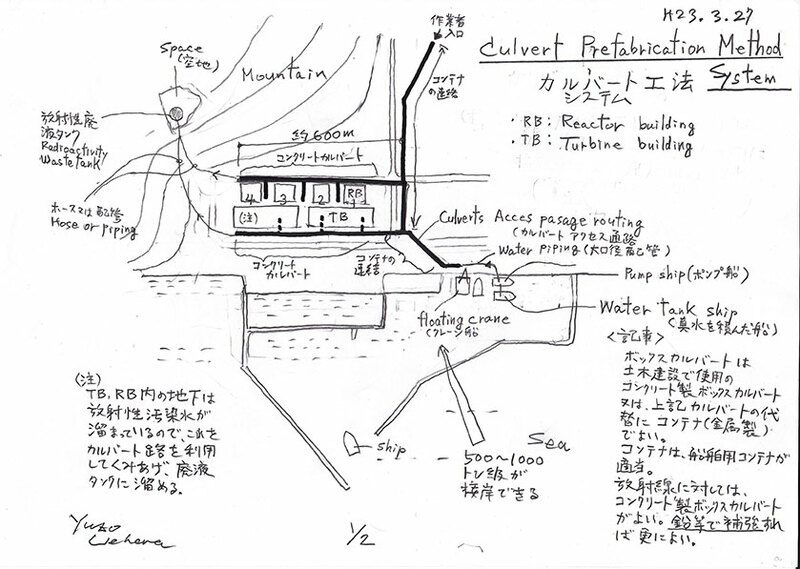 The source of the radioactive plume must be identified in order to eventually be capped. That takes specialized airborne equipment TEPCO does not have. It is urgent to do this before the winds shift to a summer pattern and blow the contamination inland. Dismantling the site, a 2000 ft by 600 ft mass of radioactive machinery and structural debris 150 ft high will be an enormous task better suited for one of the worlds large construction companies than for TEPCO, but is really outside of anyones experience. I think the cost of this accident will be around $100B, if we are lucky and avoid large scale poisoning of central Japan.